Boost energy levels and stamina in the mature years! How has VitaliTonic helped others? How do I use VitaliTonic? How long does a bottle of VitaliTonic last? Struggle to find the motivation to seize the day? Wish you could restore the zest of your younger years? Most of us work our entire lives towards one goal: retirement. Our twenties are spent establishing a career, our thirties are spent climbing the corporate ladder and nurturing young children, our forties are spent consolidating careers and raising our families. Countless hours are spent diligently working and saving money, harnessing all our efforts to create a nest egg to enjoy our later years. But often, just as we are ready and equipped to enjoy all life has to offer, our bodies become the product of years spent working too hard, worrying too much and taking care of everyone else but ourselves. Just when we finally have the resources to travel, seek adventure and enjoy our partners, it feels as though there is not even enough energy to get up off the couch! It is certainly a somewhat tragic irony that just as grandchildren reach the age where they want to inter-act with their grandparents, a grandmother and grandfather may be less than up for it due to age-related exhaustion and fatigue! Perhaps you find yourself in a position to retire, and finally purchase the holiday house you’ve always dreamed of, but are too de-motivated to even pack for a vacation! The fact remains that later years await you … filled with relaxing hobbies and rewarding activities. All of which require energy, zest and vitality to seize the day – and get up and go when you want to! The body relies on every organ to support healthy energy levels. When one body system is compromised a domino effect is created, with one system affecting the next. To complicate things further, as we age our energy supplies diminish, and we may find that we need an extra ‘kick’ to regain our zest and life force. Some people are more easily affected than others, especially if they have food intolerances, or pre-existing conditions. In addition, despite plentiful food supplies and excellent medical facilities, many people in the Western world do not really know what it is like to experience true vitality, energy and bounce. Modern Western diets, environmental pollution and the use of alcohol, recreational drugs and prescription medicines all take their toll on the body’s ability to remain energized. In extreme cases, this can negatively affect normal body functions and create disturbances in delicate body systems. Because we are people, and more than our symptoms, Naturopaths take a holistic look at the individual and take a variety of factors into account such as diet, lifestyle, personality type, surroundings and emotional elements – supporting the health of the individual as a whole (rather than treating problems in isolation). Natural remedies have been used in traditional medicine for thousands of years to support the body’s ability to boost energy levels, helping to create stamina and endurance during the later years! 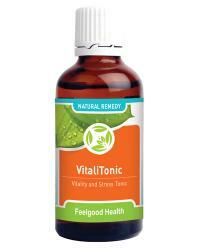 VitaliTonic is a 100% safe, non-addictive natural herbal remedy. Especially formulated by a team of experts in the field of natural medicine, VitaliTonic can be used consistently to safely maintain healthy energy levels, stamina and endurance. Containing a selection of herbs known for their ability to maintain healthy energy levels, VitaliTonic is presented in tincture form, easily diluted in juice or water and rapidly absorbed into the bloodstream. The formula remains true to the whole spectrum method of herbal extraction, ensuring the bio-availability and balance of all the active ingredients contained in the remedy. This method of manufacture also significantly reduces the likelihood of side effects and maintains all active ingredients in perfect balance – exactly as nature intended! In combination with a healthy lifestyle and diet which excludes excess sugar, stimulants, artificial preservatives and colorants, VitaliTonic helps the body to regulate energy levels, maintain balanced metabolism, stamina, endurance and healthy performance without artificial stimulants or caffeine. VitaliTonic can make all the difference in your later years, without compromising health or risking serious side effects. This formula can be of great benefit for those who wish to grab life’s opportunities with both hands and promote healthy energy levels and zest! AdaptoZen – promotes routine balance in the body across all body systems! Bio-Oxidate Defence - a natural anti-oxidant to promote cell integrity and help combat the daily barrage of a modern lifestyle! "This product has changed my life. I have always been skeptical of natural remedies, but after reading some testimonials and researching the ingredient, I decided to try it. Before I came across this product I had noticed that I was always tired and would rather sit on the couch than go for a walk with my grandchildren. After a week on this product I started to wake up with more energy, and could see the familiar sparkle return to my eyes! Thank you for my second chance at living a well-rounded life again!" "I have always regarded myself as a ‘young seventy-five year old’, but this year the later years seem to have caught up with me. I have struggled to regain that force that got me up and running each day. I feel tired and ‘flat’ with no real motivation to get out there and move. I decided to try this natural product, and I am so glad I did! I really can’t explain it, except to say that the fuel is back in the engine, and I am ready to go!" "At her insistence we recently placed my mother in a retirement village. She is young at heart, but we were told she was too tired to join in on the daily activities. She was missing out on a lot of fun and social activities because she had lost the will to be spontaneous and active. We purchased this formula and have been so pleased with the results. She is playing tennis and seems to have gotten ten years younger! Thank you so much for such a great product." "I had to write in and tell you that this product has changed my father-in-law’s life! He recently moved in with us. For the first few weeks he just moped around – always tired and lacking the usual zest that he was known for. My wife was really worried - she thought he was giving up on life. We asked our doctor who recommended this natural product – what a difference it has made! He is so sprightly and full of vigor. He’s even talking about taking up golf again! Thank you for returning him to us!" Eleutherococcus senticosis (Siberian Ginseng) One of the most important active ingredients in Siberian or Oriental Ginseng is the ginsenosides, which greatly improve blood flow to the brain and peripherals. In oriental medicine, Ginseng is highly respected and prized as a herb which boosts energy, aiding circulation, supporting natural vitality and acting as an overall systemic supporter. In a recent study Siberian ginseng was shown to be of particular benefit to those in their senior years! In another recent study Siberian ginseng was shown to increase stamina and fitness. Ginseng extract has also been evaluated for its ability to support the bodies natural combative reaction to stress. In addition, Eleutherococcus senticosis has been researched for its possible ability to assist the body in its natural mechanisms to fight off illness and fatigue! Rosmarinus officinalis (Rosemary) Rosemary is well-known in modern herbalism as an all round tonic and energizer. Like Centella asiatica, studies have indicated that Rosemary can promote healthy cerebral blood flow (CBF). Borago officinalis (Borage) This herb is rich in oleic and palmitic acid and has been used since ancient times and was well respected by Celtic warriors who used it to lift their spirits and promote courage before battle. It is also a soothing natural anti-inflammatory herb excellent for supporting the body’s convalescent ability. Furthermore, borage has been shown to have radical scavenging compounds! Avena sativa (Wild Oats) A general tonic traditionally used in folk medicine as well as in modern herbalism, Avina sativa is said to help alleviate common nervous irritability that can sometimes ruin your day. Derived from the wild oat plant, it is also rumored to aid sexual function and promote vigor (we’ve all heard the sexual metaphor: ‘sowing your wild oats’!). Active ingredients are saponins, flavonoids, minerals, alkaloids, steroidal compounds, Vitamins B1, B2, D, E, carotene and wheat protein. Due to the manufacturing process, no gluten is found in this formula. Contains less than 1% pure pharmaceutical grade ethanol, a natural preservative, when diluted as directed. VitaliTonic contains no gluten, artificial colors, flavors, preservatives or animal products. Dilute 10-15 drops in water or juice twice or thrice times daily. Results may vary, due to a number of influential factors. Many individuals experience support of energy levels within the first week, however over time (usually 3-5 weeks) VitaliTonic will act in a supportive capacity to healthy energy levels and routine stamina. Some individuals respond sooner than others. Best results are achieved when VitaliTonic is used consistently and the recommendations regarding diet are taken into account. Be aware that lifestyle factors such as adequate sleep and health and fitness levels will all play a part in maintaining overall health and routine energy. Regular exercise will also contribute to good health and wellbeing in the later years. One 50ml bottle of VitaliTonic at full adult dosage (15 drops three times daily) will last approximately 30 days. A 120 day supply of 4 bottles is offered at a discount (see the 'Buy 3 Get 1 FREE' special).